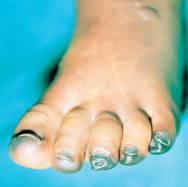 What is Critical Limb Ischemia? Critical Limb Ischemia or CLI is a severe obstruction of the arteries which seriously decreases blood flow to the extremities (hands, feet and legs) and has progressed to the point of severe pain and even skin ulcers or sores. Critical Limb Ischemia (CLI) is often present in individuals with severe peripheral arterial disease (PAD). CLI is very severe condition of (PAD) and needs comprehensive treatment by a vascular surgeon or vascular specialist. This condition will not improve on its own! The ankle-brachial index (ABI) is a simple, reliable means for diagnosing PAD. 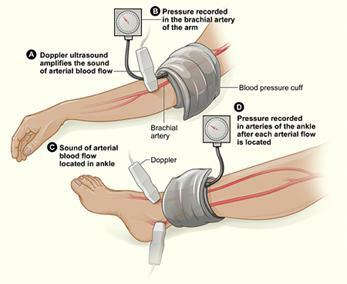 Blood pressure measurements are taken at the arms and ankles using a pencil shaped ultrasound device called a Doppler. A Doppler instrument produces sound waves (not x-rays) and is considered noninvasive because it does not require the use of needles or catheters. The ABI test is used to document the presence or absence of PAD, and can be performed every year to quickly assess whether PAD is getting worse. Obviously, treatment for the disease tries to slow the rate at which leg arteries become blocked. The ABI can also predict how severe an individual's atherosclerosis is and the risk of future leg problems (such as development of future leg rest pain, poor healing of foot wounds, need for leg bypass surgery, or amputation). It can also predict the risk of future problems from atherosclerosis in other parts of the body (such as heart attack and stroke). Lower ABI values are associated with a higher risk. In fact, the ABI value can be an accurate predictor for patients with coronary heart disease (such as the blood cholesterol value, coronary calcium score, and C-reactive protein value). 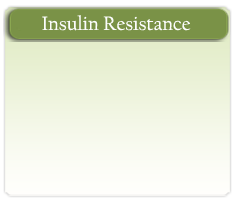 An ABI value of less than 0.40 indicates severe PAD. Patients should be extremely careful to avoid any foot injuries. Proper foot care may prevent development of non-healing wounds, rest pain, or even gangrene. Usually, care from a vascular specialist is required. The specialist will evaluate the risk and benefits to improve leg blood flow through surgery or other interventions. 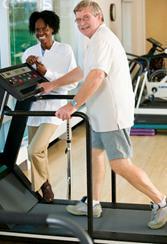 A program of supervised exercise training is at the cornerstone of treatment for reducing claudication symptoms. The main activity to be performed is walking. A program of exercise can be expected to increase the speed, distance, and duration of walking before symptoms occur. The benefits from exercise occur gradually and become evident over 1-2 months, and continue to increase for 3-6 months and longer. An important goal of rehabilitation therapy for an individual with PAD is to relieve the claudication symptoms, restore exercise capacity, and to reduce cardiovascular disease risk. How is exercise therapy different? Exercise for claudication is different than exercise advised for many other conditions since exertion to the point of leg pain is required for maximum benefits. The insufficient blood supply that causes the leg pain during walking is also the stimulus for many of the favorable changes that lead to the ability to eventually walk longer. For this reason, exercises that use muscles that do not result in claudication pain are not beneficial for improving claudication symptoms. For example, working out with the arms, would not produce leg pain. Bicycling, which primarily uses the upper thigh muscles, would not typically produce claudication pain of the calf muscle and is not as effective an exercise for improving claudication. What should be done beforehand? Because PAD is a form of atherosclerosis, individuals with this condition are also at risk for cardiovascular disease and stroke. Therefore, it is important for individuals who plan to participate in a claudication exercise program to see their physician before starting an exercise program to assure that they can safely participate. The physician will review your cardiovascular health history, perform a thorough physical examination and a resting electrocardiogram, and may recommend that you undergo an exercice stress test on a treadmill. How long should I perform an exercise program? 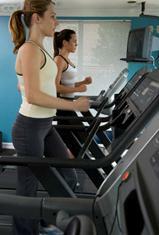 An exercise workout should be done on a treadmill under medical supervision. If a treadmill-based program is not available, exercise can be effectively performed on a track. Exercise should be performed at least three or more times a week. On a scale from 1-5, where 1 is mild pain and 5 is very severe pain, a pain level of 3 is the target. After 8 to 10 minutes, there should be a brief period of rest to allow the symptoms to resolve. The exercise-rest-exercise cycle is repeated several times so that a total of 35 minutes of walking is achieved in the first few sessions of the program. A very important precaution is that while moderate pain in the leg is expected and desirable, pain that occurs elsewhere in the body is an indication to stop. For example, pain that occurs in the chest, arms, neck, or throat could be a sign of insufficient blood flow to the heart. How Long Should the Change Last? If you can make the changes your physician suggests, you'll start seeing the effects within six months. But the benefits only last as long as you keep it up -- if you start smoking again, for example, you'll end up back where you started. Look at the changes you make as a new way to live, not as temporary "diet" or brief, healthy binge. Yes. 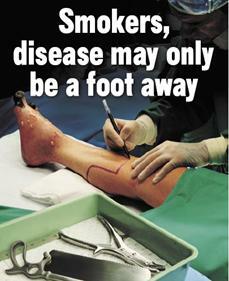 If you are smoking in any way, shape or form, your symptoms will not go away and treatment won't work. The medications your doctor gives you won't work if you are smoking. Even one or two cigarettes a day, or low nicotine cigarettes, cause damage. You have to quit, not cut back. Every year, smoking causes 350,000 deaths. Most of the deaths are caused by heart attacks. Tobacco use of any type hurts your heart and blood vessels in two major ways. First, nicotine narrows blood vessels. Second, the carbon monoxide in smoke damages the cells that line arteries so they get hard -- it's difficult for blood to move through narrow, inflexible passages. Your physician might give you medicine or suggest changes in your diet to lower cholesterol. Cholesterol levels can go up or down based on the amount of saturated fat and cholesterol in the food you eat, your weight, and the amount of exercise you do. To some extent, cholesterol levels also are hereditary -- if your parents had high cholesterol, you are more likely to have it too. Inherited or not, you can lower your cholesterol levels by reducing or eliminating meats high in saturated fat, whole dairy products (this includes cheese! ), coconut and palm oils (these show up in many store-bought cookies, cakes, and crackers.